Legalising all UK documents for use in Ethiopia. We strive to make the document attestation process as easy as possible. Send your documents to us and we will ensure they are correctly attested for use in Ethiopia. UK documents must be legalised by both the UK Foreign and Commonwealth Office, via the Apostille, and by the Ethiopian embassy in London in order to be recognised in Ethiopia. 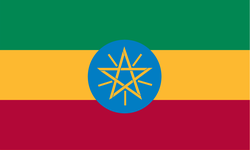 Our complete service will ensure your documents are correctly legalised for use in Ethiopia. Simply select the service you require and send your documents to us. Get in touch if you would like further guidance on this process. Processing time 7-8 days for most orders. Company documents will often require legalisation for UK companies conducting business in Ethiopia. This may be required when opening a branch, banking, exporting or creating contracts. Our experience will ensure we complete the service without delay. What does the Ethiopian attestation look like? 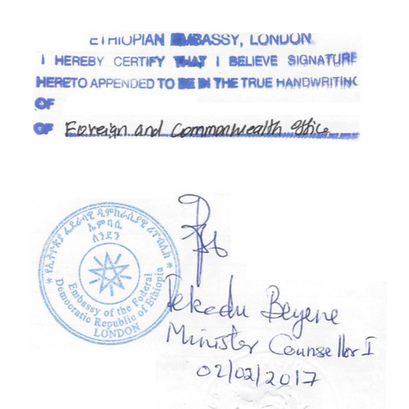 The embassy apply an ink stamp on the back of the document itself. This confirms the name of the UK government official who issued the apostille. The attestation is also signed by an official at the embassy.